I think it is quite a natural thing to be quite critical of our own abilities as mothers, and as parents, so it is really important to rave about the things we are great at. I was recently tagged by That Noise is Mine to think of 10 ways that I am rocking motherhood and I thought it would be a chance for me to really think about how I am shaping my daughter's life. 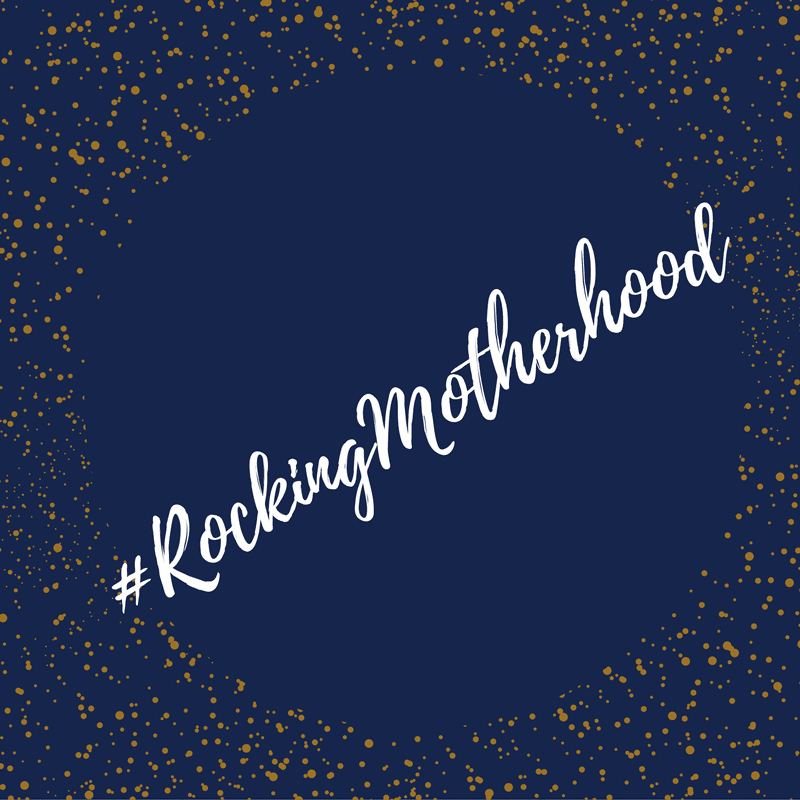 The Rocking Motherhood tag was started by White Camellias in 2016 and asks mums to list 10 ways they are rocking motherhood. The tag goes on to say that once you have listed your 10 ways, you should tag 3-5 other bloggers to also do this tag. Most of the people I talk to on a regular basis have done this post already, so I will only tag a few and then link my favourite one from a daddy blogger below. If you don't know what the mum uniform is, you are in for a real treat. The mum uniform is simply a striped t-shirt, or dress, leggings/jeans, converse and a mum bun. The perfect mum bun is hair that is thrown up on top of your head, a bit like a pineapple without being brushed. Bonus points for if it is greasy and in need of a wash too. The mum uniform also involves a nice bit of snot/food/other body fluid smeared across the front, or the back, or even both for that matter. Again, bonus points if you notice these stains but still wear the outfit for an extra day. I will admit that this meal takes place any time between 7-9PM once Elise has gone to bed, and okay sometimes "decent" means a veggie burger and sweet potato fries. I always make sure to cook some beans though, I mean they are healthy right?! The rest of the day I'm like a farm animal and I just graze away at whatever I can eat hiding behind a cupboard door. I don't always use mouth wash, and I don't think I have ever flossed, but my teeth are brushed no matter how tired I am before bed, and if I didn't brush them in the morning I think the whole street would be able to tell. Getting to the dentist is a totally different matter, so it is probably best that we move swiftly on. *Disclaimer...this may be a white lie. Sometimes I may actually just fall asleep before brushing them. Television characters, a piece of fluff on the floor, a random street lamp, light bulbs...you name it. It doesn't matter what inanimate object my daughter points out, I can act like it is the best thing I have seen all day. I didn't know that recycling bins could be so exciting, but now I know they are one of the most exciting parts of walking on to the drive way! I don't want to toot my own horn too much, but I think that I am pretty great at telling stories. My husband is not that great, he has a monotone voice for the entire story and Elise gets bored, but when I read a book her face lights up. I get in to the story. I become the characters. I think it is because I love reading fiction, but my husband loves reading text books. I'm a creative person so making characters come to life just comes naturally to me. Okay, okay...when Elise was a bit younger this wasn't the case. There was so much to remember, and you have to pack so much stuff just to leave the house. Now though I've got it nailed. I pack the changing bag at the beginning of the week so I know that I've got enough supplies. I make a packed lunch for her so she isn't hungry after classes, and then we leave early. We even leave before the alarms I set go off sometimes. I'm like a total super mum...well for now anyway! As it is just the three of us, being a parent can become really tiring at times. I get ill and don't have anyone to look after Elise, so my husband occasionally has to take time off. I know when to let him take over, which I think is a good thing. I don't let myself burn out. We love music in our house. Both my husband and I play instruments, and we're always listening to something. Elise also loves music, and even though she loves listening to jazz, she also loves baby music. I must say it wasn't that hard listening to Disney music as I love a bit of Disney, but there are only so many times I can Wind the Bobbin Up or hear a baby on a bus going Waaa Waa Waa. I feel like I have finally embraced the music. For my own sanity I just go with it...or I just put headphones on to block out the baby music. This is a big one for me. I have managed to take Elise to regular ballet classes for the last 6 months or so. I've only missed a few weeks and for me that is amazing. I suffer so badly from anxiety, not so much now as I used to, and to be able to put that aside for Elise has been something that challenged me at first. I can now say that I'm not afraid to turn up at classes and talk to other mums. In fact I asked to set up a playdate the other day. I feel like this is something I can really be proud of. Elise is only 16 months, but already she is becoming a little chatterbox. I can see how she is learning to be polite, and I just love to see it. She already tries to say "Thank you" and says "Nice", "Night Night" "All Done" "More Please". (Or at least she tries her best to). This is something that was really important to both my husband and I. We wanted our daughter to learn manners from an early age. I can see just how kind and thoughtful she is becoming and it makes my heart so happy. 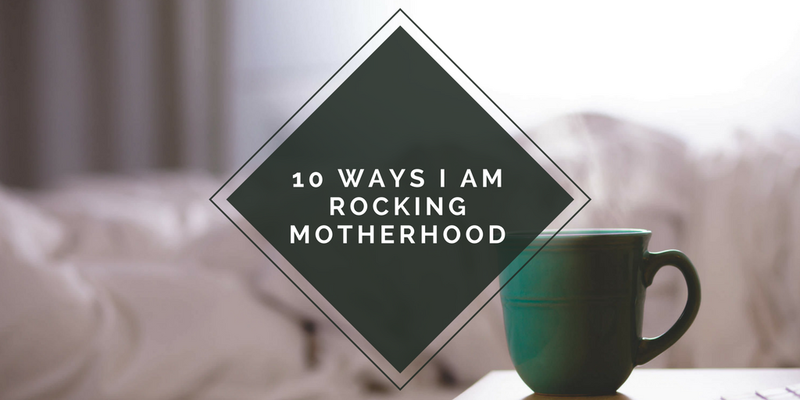 So there are 10 ways that I am rocking motherhood. I am going to tag my friend Donna over at Bobsy's Mum and Sherry over at Kits and Vixen to tell me 10 ways they are rocking motherhood. I think you should also go over and check out Benny's post on why he is rocking fatherhood . Have you written a post on the ways you are rocking motherhood? I would love to read them so please link them below! This is awesome. I hear you on the excited thing. I haven't embraced all kids music though. Disney music I can handle, but complete kiddie music? No thanks. Pass. I love your uniform, I think mine matches exactly including the food and other badges I wear with pride. Getting places on time or early??? Wow, you are really rocking it well done mama! Yup I have the uniform too! But the women in Paris have such a such a well curated thrown together look. Me I am just thrown together and hope it all works! Sounds like you've got this mom thing down. I laughed at some of your entries and with three boys under the age of 13, I am intimately familiar with the mum uniform. You are rocking motherhood! Well done you! I love going to classes with Erin. I laughed at the mum uniform one. My mom always wore a striped shirt and jeans. It was her mom look. And yay to meals and brushing teeth! Your Mom look is way nicer than mine! Though I recently suffered a terrible haircut that resulted in much shorter than planned hair so I am rocking mom hat for probably the next year! I love this, and leggings/yoga pants all day! Such a great compilation. It is not easy to be a mother, really. I salute each and every moms all over the world! Oh, advance Happy Mother's day to you! You are really rocking Motherhood. I'm not sure how long it took me to get back on track with arriving to event/appointments on time once my son arrived. I'm a grandmother, but I do try to teach my granddaughter the importance of manners. When I am out with her and her mother, her mother asks her a question and she tells her mother YEAH! I ask her can you say "Yes, Please" or "Yes Ma'am" and she will say it right after me! She tells everyone including children "Thank You" so that's an accomplishment! LOL I just hate the word YEAH coming out of a 2 1/2 year olds mouth, just sounds a bit sassy. Hehe nice post!! I still have the mum uniform, even though my kids are all older now!! I can so relate to this post. I am rocking motherhood in similar ways too. #4 makes me laugh because that's what I tell people when I tell them I've rocking the teaching world. Kids are much more likely to find something amazing if you act like it is, really, truly, amazing! You are rocking it. Brushing your teeth twice a day. You are lucky. I get mine in first thing in the morning and just fall in bed at night and forget. You sure have it worked out. Enjoying your children is the best thing and if you can get yourself in there as well you have a bonus. Great post.